Reference number for this case: 29-Sep-54-Rigney. Thank you for including this reference number in any correspondence with me regarding this case. "Until now I was skeptical, now I believe"
A resident of Besançon saw a "saucer"
Besancon (from our newsroom). -- "Until now, I was skeptical but now I am not skeptical anymore" told us yesterday evening, while speaking about the flying saucers, a person completely worthy of faith since he is a teacher, Mr. Gazon, of the Saint-Etienne school, street Ponchaux, in Besançon. Wednesday, at approximately 8 p.m., Mr. Gazon was going back home in the Haute-Saône, in Filain. He used the road while passing by Marchaux and Rigney. He came to exceed the train station of this city and he climbed, at the wheel of his 4CV [popular compact car], the small hill near the big farm of la Roche, when he saw emerging on his left an object which had the oblong form that one allots to the flying saucers or the cigars, according to the image one employs to talk about them when one sees them. "It was certainly not an aerolite, told us Mr. Gazon, for those fall generally in rain. This object moved on the contrary horizontally at a very high speed from the left to the right. It was impossible for me to evaluate neither its approximate size, nor the distance to which it was from me. In the eye, it made me the effect of an object which would have been about fifty centimetres long; i.e. rather large. It was accompanied by a phosphorescent gleam of bluish colour." Mr. Gazon was so much impressed that he stopped his car and went down for better noting the phenomenon. But when he was on the ground, he did not see anything any more and especially he did not hear any noise. He announced to us, in addition, that a few kilometers before he had noticed in the sky several rather vague luminous phenomena comparable to flashes. He finished his report by giving us this appreciation which implies that he is not a person likely to invent stories nor to believe in confusing things: "If you want my opinion on all these stories of saucers and cigars, I would say to you that I do not believe that all this comes from another planet. From now on, I believe in the existence of the flying saucers, but I do not believe in the Martians." In addition, our correspondent of Rougemont, agglomeration located in the direction of Rigney, passed the following information to us: A resident of Montagney, coming back from Rougemont, Wednesday evening, was very surprised to discover in the sky an immense gleam coming from a sphere of approximately the size of the moon when it is full. Going faster, he returned to the village and alerted his neighbors. This luminous object, though smaller than previously, was still quite visible. Six people managed to look at it. The saucer, if it were really one, moved from East to West. Let us notice that this direction coincides with that indicated by Mr. Gazon. Aimé Michel noted a number of sightings on September 29, 1954, and says there was one in Rigney, in the Doubs. He said that at about 8 p.m., Mr. Gazon, a teacher in Besançon, was driving on the national road 486 to return home in Filain in the Haute-Saône. He had just passed Rigney, 15 kilometers southwest of Montagney, when he saw emerge on the left, that is to say, in his north field, an oblong object spinning horizontally to the west and spreading a greenish white light. He looked at it a while, then stopped and went down, but the object disappeared quickly. He had stopped his engine, and could note that the object made no sound. "A few miles before seeing the object itself," he had reported, "I noticed in the sky some weird fugitive brightness." Michel indicates his source is the Charles Garreau file. Jacques Vallée lists a sighting in Rigney, France, on September 29, 1954. Charles Garreau mentions that there was an observation on March 29, 1954 in Rigney in the Doubs. 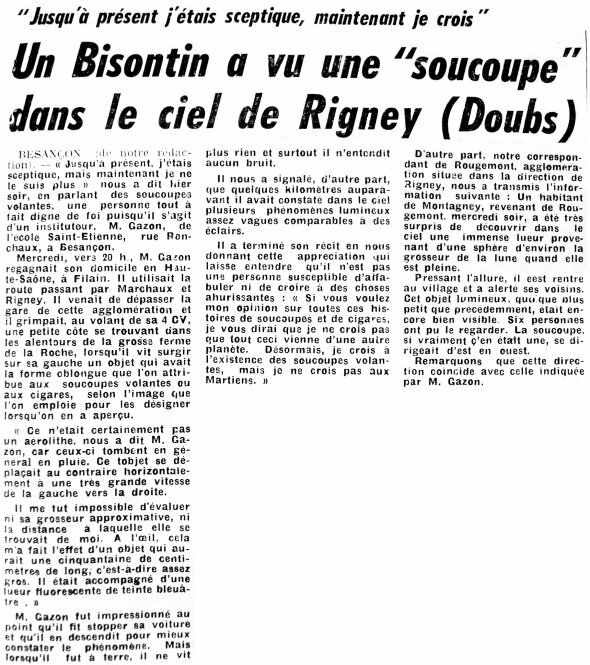 Luc Chastan indicates that in the Doubs in Rigney on September 29, 1954 at 20:00 hours, "The witness comes from Besancon and drives on the N486. He has just passed the borough when he sees emerging on his left an object of ovoid shape slipping by horizontally towards the west and spreeding a greenish white light. The witness stopped his vehicle and got out of it, but the object quickly disappeared. A few km before the observation the witness had observed curious fugitive luminosities in the sky." The website indicates that on 29 September 1954 at 20:00 on the N486, near Rigney, France, "A cigar-shaped object was observed. One cigar-shaped object was observed by one witness in a pasture for over one minute (Gazon)." [---] French ufologist Charles Garreau's file. [am1] "Mystérieux Objets Célestes", book by Aimé Michel, Arthaud publisher, France, pp 134-135, 1958. [le1] Article in the newspaper L'Est Républicain, France, October 2, 1954. [jv1] "Challenge to Science: The UFO Enigma", book by Jacques Vallée and Janine Vallée, Henri Regney publisher, USA, 1966. [jv1] "Challenge to Science: The UFO Enigma", book by Jacques Vallée and Janine Vallée, Neville Spearman publisher, USA, page 213, 1967. [cg1] "Soucoupes Volantes - 25 Ans d'Enquêtes", book by Charles Garreau, Mame publisher, France, page 33, 1971. [am1] "Mystérieux Objets Célestes", book by Aimé Michel, Seghers publisher, France, pp 134-135, 1976. 1.1 Patrick Gross May 25, 2010 Addition [le1]. Change of explanation from "Not looked for yet" to "Obvious description of a meteor". 1.2 Patrick Gross June 19, 2010 Addition [jv5]. 1.3 Patrick Gross July 7, 2010 Addition [cg1]. 1.4 Patrick Gross September 30, 2014 Addition [am1]. Explanation changed from "Obvious description of a meteor" to "The September 29, 1954, meteor, about 08:30 p.m."
1.5 Patrick Gross February 10, 2017 Addition [ub1].